In the summer of 1968, at the age of eighteen, Mike McCloskey seemed poised for a perfect future. The eldest of six children, he was an honour student, gifted, industrious, well-liked. He was a star athlete. He was in love. He was heading off to Duke University, where he would play basketball and study on an academic scholarship. Within a few years, his world had begun to fall apart, and by the age of twenty-three, Mike had been diagnosed with paranoid schizophrenia. Molly was only four years old when her brother left home for college. By the time she was old enough to begin to know him, Mike was effectively gone – frequently delusional, heavily medicated, living in hospitals or care homes or on the road. As the years passed, years during which Molly – having moved from the US to Ireland – hardly ever saw or had contact with her brother, she became deeply curious about his life and about what might have been. Through reading an astonishing archive of letters preserved by her mother and grandmother, and interviewing family members and old friends of Mike’s, she began to piece together a picture of his life, before and after the illness struck. 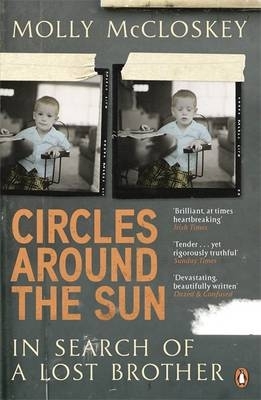 In Circles Around the Sun, she tells that story – which is also the story of how a seemingly perfect family can slowly fall apart and, in the end, regroup. Gillian has achieved success and a degree of fame as the founder of a self-help retreat for high-achievers who want to 'decelerate'. Her husband, Damien, is the public face of a new heritage village that attempts to re-create 1950s Ireland. Their teenage daughter, Heather, dyes her face blue and is addicted to the Dystopia Channel. She is the least of their problems. At once richly comic, socially observant, and deeply moving, Protection is a story of love, loss, memory and forgiveness among ordinary people in a place - contemporary Ireland - that is stranger than they know. The title novella and four short stories in Molly McCloskey's dazzling second book vary in setting, tone and characterization, but their subject, always, is love. McCloskey writes of misbegotten relationships, the mysterious communion of brothers and sisters, and the invincible love of a father and daughter, in a voice at once witty, warm and sharp. Her characters are lonely when together, and pulled by the unfathomable imperatives of the heart when alone. From the dual quest narrative of The Beautiful Changes - a daughter's quest for a lost father, and the father's quest for sobriety - to the funny and moving tales of family life and sexual misadventure in the shorter stories, Molly McCloskey shows herself to be a storyteller of the first rank. The sixteen stories in this stylish first collection return again and again to the most intimate and enigmatic of human relationships. In the title story, a woman reflects on the man she called her father, and on how the love they bore each other became a forbidden thing; in 'The Stranger', a wife is forced to see that the man she thought she knew best was the husband she didn't know at all. The disintegration of these loving relationships is evoked through a the dreamlike recall of memory - the creaking of a floor in the night rekindling the pain of a departed father, a child playing in the sand reminding a mother that love cannot last forever, the smell of roses tenderly entangling in a daughter's senses with the scent of illicit happiness. Carefully kept letters, forgotten photographs, all the debris of our secret lives is laid bare in the milky prose and fluid imagery of a new and very talented voice.